Yokogawa Electric Corporation (TOKYO:6841) announces that it has developed the ADMAG Total Insight (TI) series, a new portfolio of electromagnetic flowmeters, and will release it on May 15. The ADMAG TI series consists of the ADMAG AXG and the ADMAG AXW electromagnetic flowmeters. The ADMAG AXG is a complete redesign of the ADMAG AXF and will accommodate bore diameters from 2.5 mm up to 500 mm, while the revamped ADMAG AXW will accommodate bore diameters ranging from 25 mm to 1800 mm. Total Insight is a Yokogawa concept for optimizing operations and reducing maintenance costs through every phase of the product lifecycle. Based on this concept, Yokogawa aims to better meet its customer needs and expand its share of the electromagnetic flowmeter market. 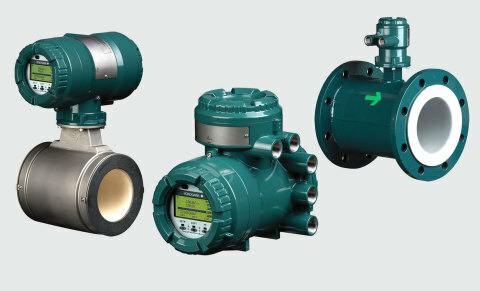 Thanks to their versatile ability to handle a wide range of applications and accommodate pipes of all sizes, electromagnetic flowmeters are widely used for measuring flow rates, which is an important function for the control of industrial processes. For enhanced immunity to flow noise, Yokogawa pioneered the use of the dual frequency excitation method in electromagnetic flowmeters, and employed this technology in its development of the ADMAG AXF, which comes in sizes of up to 400 mm and is intended for applications that require high accuracy and high corrosion resistance. For general-purpose applications, Yokogawa has been providing the ADMAG AXW. This accommodates pipe sizes 500 mm and up and is ideal for water and water-based fluid applications. In keeping with its Total Insight concept, Yokogawa has reviewed the functions needed for each phase of the product lifecycle and the performance required for each application. The company has thus reviewed its product lineup and developed ADMAG TI, a portfolio of electromagnetic flowmeters with new functions that will help to optimize CAPEX, reduce OPEX, and accommodate a wider range of applications. The ADMAG AXG is intended for applications that require high accuracy and high corrosion resistance, while the ADMAG AXW is for general purpose applications that mainly involve water and water-based fluids. As with the ADMAG AXF, ceramic and fluorocarbon PFA linings will be available for the wetted parts of the ADMAG AXG, for added reliability. With the revamped ADMAG AXW, fluorocarbon PTFE and natural hard rubber linings will be available. (The ability to use these linings with bore sizes between 25 and 400 mm is a Yokogawa first.) By choosing products with the optimum materials and required level of accuracy for their process, customers can reduce their CAPEX. New functions have been added that will help reduce OPEX throughout the product and facility lifecycle. The ADMAG TI series includes general purpose, sanitary (for foods and pharmaceuticals), submersible (for limited periods of time), and explosion-proof*1 (for use in hazardous areas) models. For each of these models, a variety of sizes, lining materials, number of signal inputs/outputs, and precision levels will be available. A selection tool*2 will simplify the process of selecting the right flowmeter for a specific application. Device parameters can be set before shipment and can also be easily changed by operators in the field, using a wizard function on the device display. The ADMAG TI flowmeters have a variety of alarm functions. For the various check items monitored by the ADMAG TI flowmeters, users will be able to whether a warning message or alarm will be issued. For optimal management of these devices, it will also be possible to configure whether alarms are to be output as pulse or analog signals. In addition, to facilitate troubleshooting, a new logging function will be available for the simultaneous logging of four different kinds of output signals. An optional microSD Card function will also be available to facilitate the retrieval of data from the field. The ADMAG TI flowmeters will have a built-in verification function that will be able to check their magnetic, excitation, and operational circuits as well as alarm logs while they are in operation. This function will help to facilitate the shift from conventional periodical maintenance to condition-based preventive maintenance, thus reducing OPEX. In addition, a new application verification function will output an alarm contact signal when a condition such as the presence of air bubbles or low conductivity in a fluid is detected. And when an unstable output signal is detected, parameter settings can be adjusted to fine-tune a process.